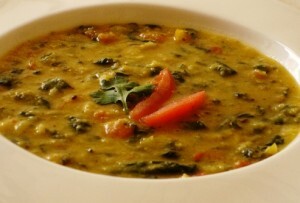 Dal Tarkay Wali recipe by * at DesiRecipes.com. Pick over the lentil thoroughly and wash in several changes of water. Soak the lentil in plenty of water for 3-4 hours. Put the drained lentil in a medium heavy skillet. Add water, garlic and ginger paste, chili powder, turmeric , coriander powder and salt . Place the skillet over high heat and bring the lentil to a boil then reduce heat to low, cover and simmer until lentil is tender and slightly mushy, about 25-30 minutes. (Add more water, if all the water has evaporated and the lentil is still hard.) Transfer lentil to a serving dish and cover with the lid to keep the lentil hot. Heat oil in a small frying pan, add sliced onions and stirring frequently saute until the onions turn golden, add cumin seeds , as soon as the cumin seeds splutter, add crushed dry red chilies and at once pour it over the lentil . Sprinkle garam masala and replace the cover on the serving dish 3-4 minutes to infuse the aroma. Sprinkle coriander leaves and chopped green chilies and serve. i wasnt sure about how to make the baghar. nice and easy.thanks.